Are your dentures ill-fitting? Do you use a denture adhesive to hold them in place and is this bothersome to you? If your answer to these questions is yes, then our fixed denture replacement solution is one option that may be the right one for you. 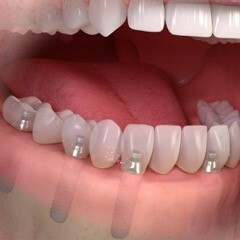 If you are missing all of your teeth in the upper and/or lower jaw or you have teeth and they are in such condition that they need to be replaced, a fixed denture replacement solution consisting of a dental implant bridge (sometimes called permanent dentures) can offer several benefits over traditional dentures. Before dental implants, there were no fixed solutions available for people who lost all their teeth. Today, it is possible to replace a full jaw with dental implants and a fixed bridge that results in a stable and esthetic solution. The first step is installing dental implants to replace the lost tooth roots. 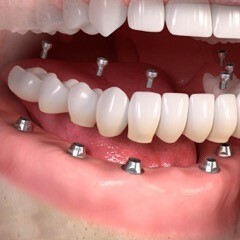 In this case, six implants are used. Temporary teeth are attached or a provisional (temporary) appliance is used that enables you to eat and function like normal while waiting for the permanent bridge to be installed. 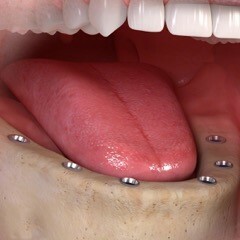 The final bridge is securely installed on top of the implants. 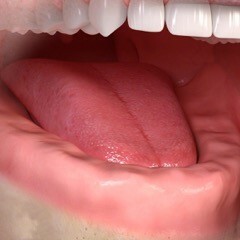 Your new teeth should be hard to tell from natural teeth – both for you and others. Contact us to learn more or to schedule a visit.